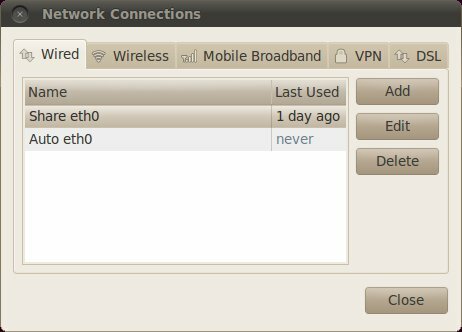 If you have more than one network card (eg: wireless and ethernet like in a normal laptop) you can decide to share your Internet connection with another computer via the ethernet cable. For example the other day I was "working" on a Linux laptop that doesn't have an integrated wireless card and the USB one had not been recognized after a fresh install. Click on the tab "Wired" (if it's not already selected) and add or edit an existing connection. In my case I'm editing the connection called "Share eth0". 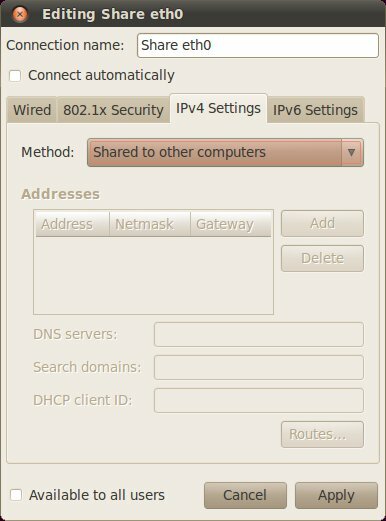 After having given the connection a name (in case you are creating it) the only thing left to do is to set the method for the IPv4 Settings to "Shared to other computers" like in the picture above. You might have to restart the service or the machine. In my case it worked without. NB: I've tested it on Ubuntu Lucid but it should work also on the most recent distributions.